A new NASA study explains why the Tracy and Heilprin glaciers, which flow side by side into Inglefield Gulf in northwest Greenland, are melting at radically different rates. Using ocean data from NASA's Oceans Melting Greenland (OMG) campaign, the study documents a plume of warm water flowing up Tracy's underwater face, and a much colder plume in front of Heilprin. Scientists have assumed plumes like these exist for glaciers all around Greenland, but this is the first time their effects have been measured. Edits: A year ago (2017-8-29) shows a different distribution of water, including, it seems, water in the middle of the crevasse instead of the up-steam edge. Crevasse is wider now. What a difference a day can make (July 17 and July 18 - dates at top of gif): check out the higher resolution Sentinel-hub images. 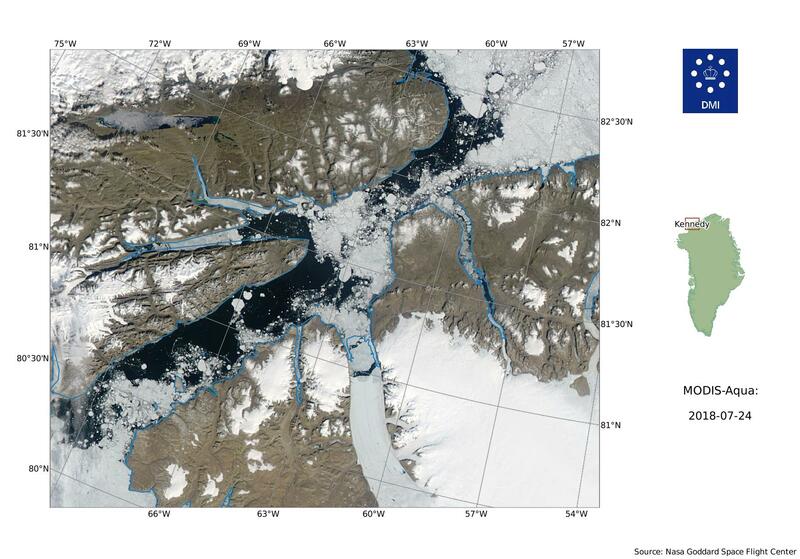 As of the 23rd a large floe has broken loose and has started moving. Any chance of these breaking off later this year? Darn it, too busy. How big is this one compared to the previous two? Neven, it is just sea ice that has broken off the front of the glacier. There is no new iceberg. Thanks, Tor! I thought it looked too blue to be true. Yea, not the sea-ice. The other bits look precarious on that south side is what I was looking at, but I'm realizing they are much more stable than they look. It looks like we had a tiny calving at Petermann, no risk for shipping or sea level rise, the small inserted image from today August 12 2018 07:45 UTC Aqua / MODIS, the calving is in the middle of glacier front above the pink arrow. A significant calving? (Worldview from 5/9, can't see anything for clouds on 6/9) Or is this just worldview drawing a previous line? Ignore previous post - looks like it is a feature of Worldview I hadn't noticed before. P.S. The ~700 m wide rhombus (diamond) shaped iceberg near the left shore short broke off of Petermann Glacier between September 5 and 7. P.S. The ~700 m wide rhombus (diamond) shaped iceberg near the left short broke off of Petermann Glacier between September 5 and 7. Looks like there could be a couple more fragments in the near future too. It looks like the big side crack made a turn and started growing towards the centre crack. When they connect the next big calving is 3/4 complete. Tealight nice spotting, we may have a very large calving next summer? Hiawatha Glacier was mentioned in this thread once, so I post this here. Much better article in Science Magazine. Dec. 16 image from PolarView. My eyes say yes to the connection but they cannot be relied upon. Petermann is EXACTLY where it was last year on this date (area wise). The shape of the terminus and it's position relative to the valleys north and south of it is unchanged. There are no major fractures sen either. This summer has been the coldest in at least 7 years in NW Greenland as well. It is still flowing 3+ m/day and the past summer looks "normal" to me. The graph is from Enveo Cryoportal. Note this post is dated 2013! Slow and steady growth of the side crack continued, now growing directly towards the centre crack and about halfway there. I'd bet they connect by the start of summer. Tried to be non destructive/creative with the enhancements. Polarview, yesterday. edit: Same treatment on jpg2000, never looked at those before. No default as it's practically all black. Much lower resolution but worldview brightness temperature might add some background info. There will always be a new one, thats the nature of a glacier? Has anyone been able to find an animation which shows the location of the calving events and the new cracks? From what I can tell, the flow is about 3,000 Ft / yr, so the face has moved ~9,000 feet, or a little less than 2 miles in since the 2016 calving. The new cracks are 8 miles from the face, so if we assume it calves this summer, that would be a retreat of about 6 miles? Sentinel-hub images of Petermann Glacier have started to be available this season - surprise, surprise, lots of snow, and the boundary between the end of the shelf and the start of fast ice is subtle (which I do not attempt to show). Here's a nice clear Sentinel Image of the Petermann. ""This indicates that, from a dynamical point of view, the terminus region has already detached from the main ice tongue."" ""if the trend of a retreating calving front continues, PG is likely to further accelerate in the future. We attribute this to a loss of buttressing caused by the retreat further upstream and a subsequent loss of friction with the fjords walls."" ""the observed speedup in 2016 suggests that the ice in the frontal part is already detached from the stabilizing fjord walls. "" 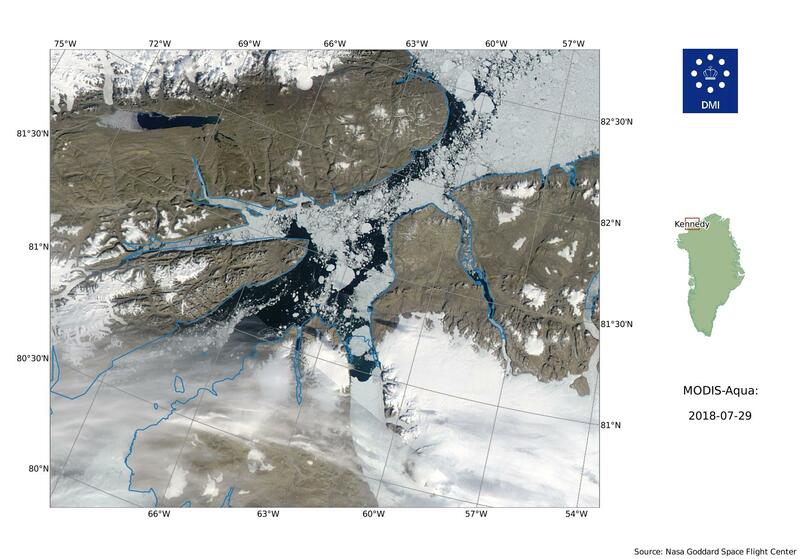 Calving Induced Speedup of Petermann Glacier. Just for fun. In light of paper posted above. I wonder which area they are saying has detatched from main tongue, and how significant that could be? Click to view animated gif of glacier over 1 year. "Cracks herald the calving of a large iceberg from Petermann Glacier" - GeoSpace - Earth & Space Science. ""Cracks in the floating ice tongue of Petermann Glacier in the far northwest reaches of Greenland indicate the pending loss of another large iceberg."" ""Glaciologists from the Alfred Wegener Institute, Helmholtz Centre for Polar and Marine Research (AWI) in Bremerhaven, Germany report in a new study that the glacier’s flow rate has increased by an average of 10 percent since the calving event in 2012, during which time new cracks have also formed – a quite natural process."" ""However, the experts’ model simulations also show that, if these ice masses truly break off, Petermann Glacier’s flow rate will likely accelerate further and transport more ice out to sea, with corresponding effects on the global sea level."" I think you can kindof see it on my July 2017 post, in the zoomed in images and markings I made. It may have become clearer, maybe not much has changed structurally deep down. Where's the grounding line on this? Most of that stuff in the image must be basically floating then? I've seen a site that shows altitude changes (breaking and lowering closer to sea-level before they fully break off) for glaciers in the Antarctic. Is there something like that for Arctic region?